I have always been a storyteller. I remember starring in a Nativity play in my cousin’s garage with my sister and older cousin wrapping sheets around us and charging neighbors a nickel. Sitting in my cardboard box full of straw, I was the star, and I loved it! That morphed into full scale musicals starring my sister and me including lavish costumes in a neighbor’s garage. Thankfully my parents and teachers indulged me (rather than committed me-hah). Eventually I became an actor in film, television, and theatre, working opposite stars like Bruce Willis, Nathan Lane, Rosie O’Donnell, Holland Taylor, and Jason Robards. It occurred to me that acting is storytelling in the same way that writing is storytelling, so I decided to give writing a try. After writing some plays, I knew my novels would include show business in some way, since show business has always been such a huge part of my life. As an avid mystery reader, it was clear to me that my novels would also be page-turning mysteries with clever plot twists, engaging characters, romance, and lots of clues leading to a surprising conclusion. Since coming from a funny Italian-American family, I also knew humor would play a role in my novels. As a child I loved child stars like Shirley Temple, Hayley Mills, and Patty Duke, seeing their movies over and over. So I created a heroine who was the biggest child star ever until she was attacked on the studio lot at eighteen years old. In PAPER DOLL Jana at thirty-eight lives with her family in a mansion in picturesque Hudson Valley, New York. Her flashbacks from the past become murder attempts in her future. Jana ventures back to Hollywood, which helps her uncover a web of secrets about everyone she loves. She also embarks on a flirtation with the devilishly handsome son of her old producer, Rocco Cavoto. In PORCELAIN DOLL, Jana makes a comeback film and uncovers who is being murdered on the set and why. Her heart is set aflutter by her incredibly gorgeous co-star, America’s heartthrob Jason Apollo. In SATIN DOLL, Jana and family head to Washington, DC, where Jana plays a US senator in a new film, and becomes embroiled in a murder and corruption at the senate chamber. She also is tempted by Chris Bruno, the muscular detective. In CHINA DOLL, Jana heads to New York City to star in a Broadway play, enchanted by her gorgeous co-star Peter Stevens, and faced with murder on stage and off. 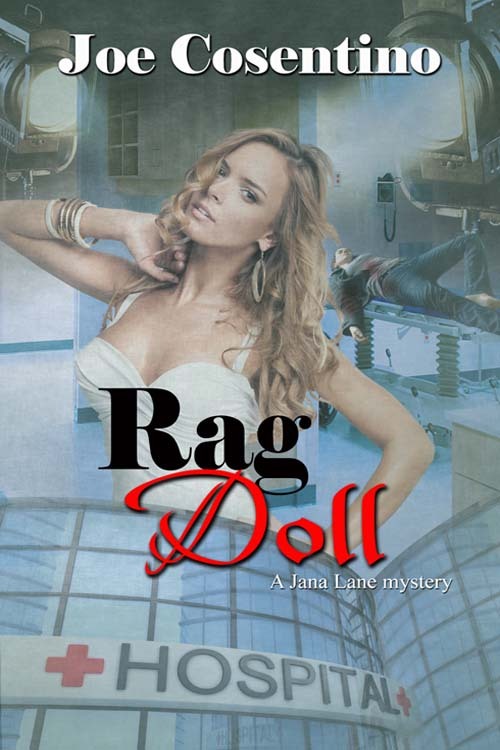 Now in RAG DOLL with Miami Vice and Murder She Wrote being all the rage of television, Jana stars in a new television mystery series, The Detective’s Wife, opposite Chris Bove, the hunky detective who got away in SATIN DOLL. Guest starring on the show is young ingénue Christa Bianca, a rags to riches story who has flooded the press. Life imitates television as Christa’s loved ones are murdered, and Christa and Jana could be next. Once again it’s up to Jana to use her knowledge from her days as America’s most famous child star and save the day before the lights fade to black. Jana’s amazingly resilient, old world Hollywood, incredibly funny, and loyal agent, Simon Huckby, is back. The other suspects include Jason, the young prop man with a secret; bit players Karen and makeup girl Cindi who have their eyes on Christa’s guest starring role; two couples in supporting roles who have a conflict with Christa and Christa’s husband/manager, the domineering Andrew Bianca; Christa’s calculating agent Stu, and her Uncle Nick, trying to stay in show business on Christa’s coattails. I’ve been told the television shooting sequences in RAG DOLL are realistic, exciting, and fun to read. I’m sure that’s because I know my way around a real television set, and I tried hard to incorporate that knowledge into those scenes. Though Jana and Brian are happily married, you can’t blame Jana for being attracted to handsome, muscular, smart, food-addict Bove, starring opposite her in The Detective’s Wife. After what they’ve gone through together in SATIN DOLL, they can be totally honest with one another. Their banter is very funny but also warm and precious. Since Jana is not available, their attraction for each other needs to stay at bay, which is quite difficult for both of them at times. I think they put that frustrated energy into solving the case. So settle back on the sofa, get the remote and popcorn, and turn on the television for the next Jana Lane mystery! BTW, I want to play Simon Huckby in the TV series!